In a small bowl, mix the yeast and a pinch of sugar. Your going to need to get your water temperature to about 110 degrees to proof your yeast. If you run the water over the inside of your wrist the water should feel the same temperature as your skin. When it gets to the right temperature, measure out 1/2 C and pour into the yeast and set aside until it gets frothy. In a large mixing bowl, whisk together the almond flour, cornstarch, salt, sugar, xanthan gum, and guar gum. If you have a stand mixer, transfer to the mixer (if not just mix well by hand). Add in the softened butter, egg, and yeast mixture. Mix well. Dough will be about the same consistency as cookie dough. Cover and place in a warm place to let rise for 1 hour. If your house isn't warm enough for your rolls to rise, gluten free girl says to heat your oven to 200 degrees, put in the rolls, put a pan of ice cubes on the rack below the rolls, close the door and turn off the oven. Lightly grease a cake or pie pan. 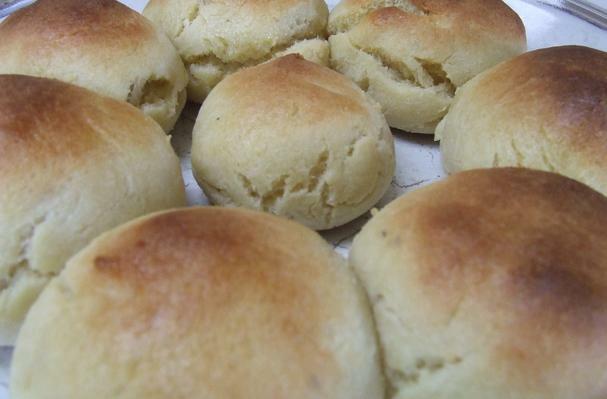 I sprayed my hands with cooking oil to help the dough not stick to them and then roll the dough into golf ball sized rolls. Makes right at 8 rolls. Place in a warm place again and let rise, uncovered, another 30 to 45 minutes. Brush the tops with melted butter and bake 15 to 20 minutes or until nicely browned. Brush with more melted butter as soon as they come out of the oven and eat as soon as possible!